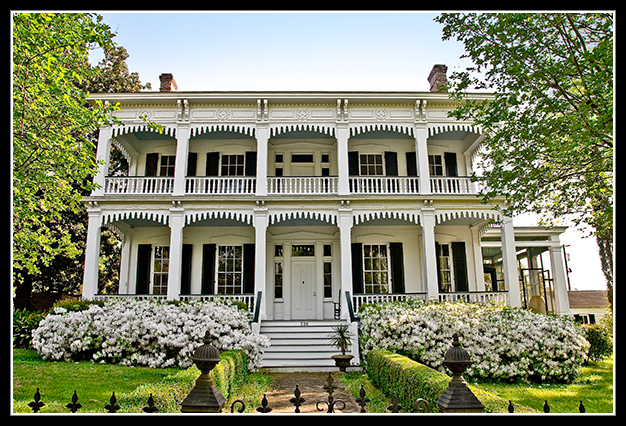 The largest surviving house of the pre-Civil War period in Yazoo City, the Wilson-Gilruth House was probably built soon after the site was purchased in 1846. The front of the house comprises two levels of porches with rectangular section columns and turned balustrades. The original Greek Revival character is somewhat masked by decorative woodwork screens inserted between the columns, probably about 1881. However, many of the architectural details from the 1846 construction remain intact. It is believed that the house was pre-cut and shipped down from Cincinnati, Ohio. In the 1990s, a screened porch addition earned a “most sympathetic addition” award from the National Trust for Historic Preservation.